The United States is in an extended period of rapidly rising inequality. Starting in the mid-1970s, all measures of U.S. economic inequality have risen, including inequality in wages, income, and wealth. This development has made income distribution and income inequality a topic of substantial interest among researchers and policy analysts who focus on economic and social issues in the United States. This book adds to the discussion about inequality in two ways. Part 1 provides a comprehensive look at changes in the level and distribution of income since 1979. Part 2 discusses the forces that drive changes in inequality. Whereas most research on inequality has focused on wages, the first part of this book shows how changes in the distribution of wages combine with changes in hours and weeks of work to affect annual earnings among workers. In turn, changes in the distribution of annual earnings combine with changes in government income and other income to affect the distribution of total income among families and individuals. I focus on the changing distribution of per person income available to nonelderly persons between 1979 and 2007. Changes in income distribution are affected not just by changes in income sources but also by changes in the family choices made by men and women deciding to marry (or not) and to have children (or not). The analysis in this book investigates the impact on the overall income distribution of changes in the demographic choices of families and individuals, as well as changes in income components. It is well known that inequality has risen sharply over the last three decades. The results of this detailed analysis indicate that changes in family composition and family size account for about 15 percent of the rise in U.S. income inequality, while changes in income account for the remaining rise in inequality. Most of this rise is due to increases in wage inequality. Many readers may be surprised at the extent to which per person income has risen for nonelderly adults in the United States. This is true across the income distribution, so that the whole distribution has shifted upward even as it has spread out and become more unequal. The only exception occurs at the very bottom of the income distribution, where there has been an increase in the number of persons at the lowest levels of income. Some of this increase in per person income is due to declining family size, but the primary reason for this change is more hours of work in the labor market among women. This shift in women's work behavior has increased income in married-couple and in single-female-headed families. After adjusting for inflation, median per person income among nonelderly adults has risen 24 percent since 1979, to $36,900 in 2007. Of course, adults in married-couple families have higher incomes than those who live singly or who are in single-headed families. Hence, rising inequality is occurring in a framework of rising overall incomes for most nonelderly adults, which may be one reason why the policy concern with inequality has remained muted. These changes, however, are not due to increases in wages for many persons, but are due to increases in the work effort within families, and particularly by women. Although such increases in work effort may give women more financial independence and reflect a decline in labor-market barriers, this also means that a higher share of women's time is dictated by the demands of market work. 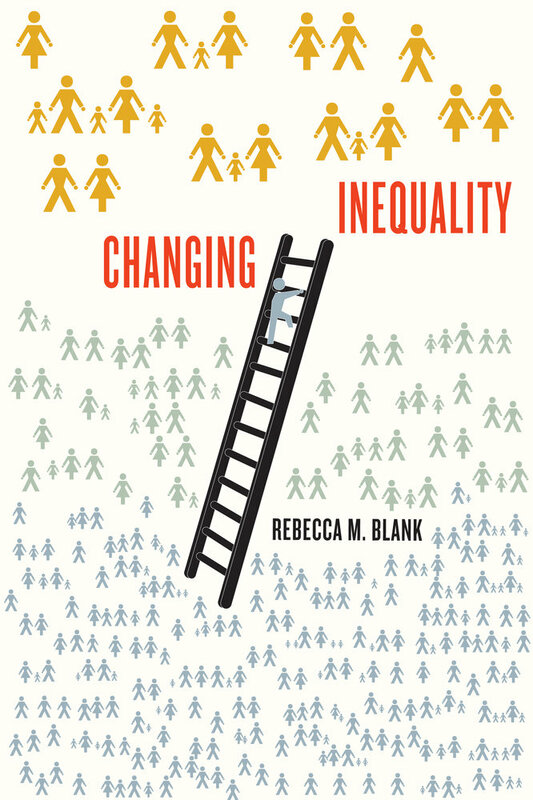 The second part of this book examines the forces that drive changes in inequality. Economic inequality is affected by economic shocks, which can be immediate (a natural disaster, a pandemic, or a war) or can unfold slowly over time (global warming, the introduction of computer technology, or the rise of public universities). These forces can shift the availability of human skills and physical capital in ways that change access to income and shift the income distribution. These economic changes are mitigated by political institutions and policy choices. As historical examples indicate, the effects of economic shocks on inequality depend upon the institutional environment in which they occur, so that similar economic shocks can result in quite different long-term distributional effects. After a review of how some past economic shocks may have affected inequality, I look at the potential impact of future economic changes. Reversing the rapid increase in inequality over the past three decades will be difficult; even large equalizing future changes in work effort or family composition (changes that are unlikely to occur) would not bring inequality back to its 1979 levels. This suggests that higher inequality is likely to remain a feature of the economic landscape in the United States for many decades to come. Why Should We Care about Inequality? Although rapid changes in any aspect of the U.S. economy are always of interest to economists, changes in inequality may generate broader concern, because rising inequality can have effects on a host of other economic and social outcomes. At least four effects of rising inequality are most commonly mentioned. First, if increases in inequality reflect declines in the well-being of those at the bottom of the income distribution, this raises questions about the well-being of the poor in a rich, developed nation. Adjusted for inflation, wages fell among less-skilled male workers in the 1980s and have only partly recovered in the years since then (Autor, Katz, and Kearney, 2008). The effects of falling wages have been much discussed, with particular attention on the extent to which declining wages have led to declines in male labor-force participation and in marriage rates among the less skilled-both of which are associated with higher poverty. Second, widening inequality may lead to reduced economic mobility if greater inequality makes economic gains harder for those at the bottom of the income distribution or if it reinforces the economic position of those at the top. Economic mobility is often viewed as a measure of openness and opportunity in a society. High degrees of inequality may be more acceptable if economic hierarchies are not stagnant and people at the bottom of the distribution move to the top of the distribution with some degree of frequency. There is evidence that intergenerational economic mobility in the United States has been lower than in other highly industrialized countries over the past several decades (JΣntti et al., 2006). Whereas mobility reductions may have limited short-run effects, over time they can intensify economic and social stratification. Since a disproportionate share of low-income families are headed by people of color or by single mothers (of all colors), children from these families may face particularly reduced economic opportunities in a time of rising inequality, intensifying racial differences as well. Of course, these economic changes may also affect social roles and increase the sense of social distance or class difference between groups. Third, inequality may have an effect on aggregate economic growth over time, although both the sign and size of this effect are disputed. Milton and Rose Friedman (1979) argue that greater inequality can spur ambitious work effort by those who want the larger rewards available to top earners, and that this can lead to higher economic productivity. Others argue that a growing group of poorer and non-upwardly mobile persons create economic costs and can impede aggregate growth. For instance, in a recent book Richard Freeman (2007) argues that rising wage inequality may reduce productivity. He reports on experiments showing that as rewards become more unequal, the efforts of those at the bottom are reduced because they believe they have no chance of achieving these rewards. There is an ongoing debate in the empirical literature about the relationship between economic inequality and growth in both poor and rich countries. Much of the quantitative research on the relationship between inequality and growth suggests that the relationship is relatively weak and that other factors have greater effects on growth (Barro, 2000). These are difficult relationships to measure, however, because they unfold only over long periods of time, and it is hard to isolate the causal effects of shifting inequality when other things are changing at the same time. Finally, rising economic inequality may affect civic and social behavior outside the realm of economics. For instance, there is evidence that inequality in the rate of voting in the United States has widened at the same time that economic inequality has increased (Freeman, 2004). If widening differences in economic experience lead to different perceptions about who has won or lost from past policy changes, it may become harder to hold a common civic conversation about public policy concerns. Widening inequality may increase social discontent among lower-income groups or reduce the empathy that higher-income groups have for lower-income groups. Regardless of its effect on social discontent, areas with higher inequality appear to have lower rates of self-reported happiness (Glaeser, Resseger, and Tobio, 2008). While some are concerned about the effects of widening inequality, others may believe that wide differences in economic outcomes are, per se, undesirable. For instance, the "Scandinavian model" of social welfare is often associated with a belief that a more equitable economic distribution of income is a desirable social goal. In general, however, Americans are less concerned with levels of inequality than are Europeans, and tend not to place a high value on greater economic equality in itself. Hence, the discussion about inequality in the United States has focused more on whether rising inequality has undesirable economic or social side effects rather than on the fairness of these changes. For all of these reasons, rising economic inequality within the United States has drawn ongoing attention. The primary goal of the book is to describe shifts in the distribution of income among working-age adults over the last three decades and to consider how and why inequality might change in the future. The book looks at how these shifts have differed by gender and by the type of family in which adults live. The analysis explores reasons for these changes, investigating the different components of income and looking at the forces that are driving widening inequality in overall income levels. Although much research has focused on changes in hourly or weekly wage inequality, there has been less attention to other components of income. Changes in annual earnings inequality among workers are the result of changing inequality in hourly wages and in hours of work, and of the interaction between these two components of earnings. Changes in total-income inequality depend upon changes in family size, changes in the number of workers in a family and their wages, and the correlations between these factors. They also depend upon changes in inequality in other (i.e., unearned) income. In the first part of this book, I look at the trends in inequality over the past three decades in all of these components of individual earnings and of family income, to identify which of the components that determine income have contributed the most to rising economic inequality. Chapter 1 provides a brief description of the data that I use in this study. I describe the groups that I am looking at and the years over which I study changes in inequality. I focus solely on nonelderly adults, because I am interested in the relationship between labor-market changes (where wage inequality has widened markedly) and overall changes in the level and distribution of income available to individuals within their family units. Chapter 2 focuses on the labor market, looking at shifts in wages among workers. The results in this chapter underscore the different ways in which the distribution and level of earnings have changed among employed men and women. Although I replicate the evidence showing widening inequality between more- and less-skilled workers, the overall growth in skill levels in the U.S. workforce has shifted wages upward. Furthermore, women are working much more than before, so their annual earnings have grown markedly, largely due to increases in weeks worked per year. While hourly wages have become much more unequal, this rising inequality in wages has been somewhat offset by falling inequality in work effort among workers, with more workers working full-time and full-year. The result is that the overall distribution of annual earnings among workers has shifted upward, even while wage inequality rose. Some may be surprised to learn that annual earnings have grown among workers in the bottom half of the earnings distribution. This is almost entirely due to greater work effort on the part of women. Chapter 3 turns from wages and earnings to the distribution of total income among all nonelderly adults. I look at shifts in the distribution of total income among single individuals and among persons living in married-couple families and single-headed families. I also look at comparative changes in the three primary components of annual income-namely, annual earnings, government income, and all other unearned income. Strikingly, both for earnings and for total income, I find that increases in inequality are accompanied by a substantial upward shift in most of the income distribution, so that overall incomes are growing at the same time that their distribution is becoming more spread out. Incomes among those in the middle of the distribution have risen substantially, although there has been an increase in the share of persons with very low incomes. Rising inequality around an increasing median leads to an income distribution in 2007 in which almost everyone has higher incomes than persons at equivalent points in the income distribution in 1979, except for the very lowest income group. Rising inequality is typically viewed as less of a problem when it occurs in a context where most people are doing better. Chapter 4 explores the reasons behind these changes in the distribution of total income and discusses what they might mean for overall well-being among American adults. I look at the effects of changing family composition and family size, as well as the effects of shifts in the distribution of earnings and other income components. About three-quarters of the increase in inequality in the overall distribution of income occurred because of increases in the inequality of income components-primarily, increases in annual earnings inequality. This, in turn, occurred because of increases in wage inequality. Much of the increase in median income occurred because of increases in earnings due to increased female work effort. Hence, understanding the effect of increasing work effort on overall income is very important in analyzing the effects of rising inequality on the well-being of Americans. Increases in work effort are not unambiguously positive in their effects on overall well-being, even if they do result in higher incomes. This result might be evaluated very differently from increases in median earnings that are the result of rising wages. This first part of the book emphasizes the importance of understanding changes in the labor market in order to understand changes in overall income distribution. It also underscores the importance of family composition choices for economic well-being. The results in this section provide a comprehensive view of the long-term changes in the level and distribution of economic resources available to nonelderly Americans. The second part of the book steps back from data analysis to consider the forces that create, sustain, or alter long-term trends in inequality. Long-term trends toward rising or falling inequality over time within countries often come to an end at some point. It is not clear what triggers changes in the trends toward or away from long-term inequality. Indeed, economists continue to argue over the causes of recent rises in U.S. wage inequality. Chapter 5 looks at evidence from past history, largely but not entirely within the United States, to indicate how major economic shocks appear to affect income distribution over time. Economic shocks include catastrophic events that occur at a particular point in time, such as a deep recession, a war, or a major health crisis that causes substantial deaths. But economic shocks may also refer to major economic changes that unfold more slowly over time, such as new technologies that expand productivity and create new opportunities for wealth creation, or the opening up of new frontiers and the availability of additional land and mineral resources. Whereas there is substantial ongoing attention to the effects of such economic changes on overall economic growth, there has been much less attention to the effects of such changes on economic inequality. Chapter 5 goes on to suggest ways in which economic shocks can influence long-run trends toward increasing or decreasing inequality. Most important, the historical evidence indicates that the effects of a given economic shock are rarely predetermined but may be heavily influenced by the political institutions and the political economy of the nation when the shock occurs. Hence, the opening up of frontiers can consolidate additional wealth within an elite group of families, or it can provide new wealth to previously lower-income groups. Large economic shocks often influence public attitudes and political structures, creating new patterns in the distribution of economic resources as well as political access. Chapter 6 focuses on the current economic environment and looks at some simple simulations that indicate how particular behavioral, economic, demographic, or policy changes might alter the current distribution of economic resources. Most of these changes are focused on raising incomes among those at the bottom of the distribution. (Most of the rise in inequality is occurring because those at the top are experiencing very fast increases in earnings, but I assume that reducing their earnings is much less politically palatable than raising income at the bottom.) The changes that I simulate include economic changes that would reduce the proportion of low-skilled workers in the population, raise wages and labor-force participation among lower-wage workers, or reduce investment income among upper-income workers. I also look at demographic changes that would increase marriage and reduce the number of single persons and single-headed families in the population. And I look at policy changes that would redistribute resources and raise the incomes of poor workers and poor families. These simulations provide a comparative sense of the effect these different types of changes would have on the overall distribution and level of income among nonelderly American adults. In general, the results suggest that none of these changes, by themselves, would have major effects on income distribution, but a number of them together could indeed produce both higher income levels and a more equal distribution of economic resources. Even quite large changes, however, leave income inequality closer to its 2007 level than its 1979 level, suggesting that a major reversal in inequality is unlikely in the absence of substantial and currently unforeseen changes. The final chapter, chapter 7, focuses explicitly on the current economic environment. Given that we have recently experienced a severe global economic recession, I discuss the possible ways in which this major economic shock might influence long-term trends in inequality. The most likely outcome is that the current trends will persist and that the forces that have been driving increased inequality over the past three decades will continue to operate. But there are possible economic and political changes that may emerge from a deep and sustained recession that could alter the recent trend toward increased inequality and equalize incomes in the years ahead. If there is any one central message in this second part of the book, it is that rising inequality is not the inevitable result of unchangeable forces. Economic change interacts with the political economy and the set of rules, regulations, and policies enforced within the economy. Particularly in developed countries, with effectively functioning governments, the political system shapes economic outcomes. There are things that we can do in the United States to reduce economic inequality and offset some of the economic forces that have produced greater inequality. In fact, we have chosen to adopt a number of policies that have done this, such as the expansion of the Earned Income Tax Credit to low-wage earners in low-income families with children. Whether we do more is our choice. As a final note, I should make it clear that my primary interest in this book is in the more developed economies. There is a deep and ever-growing literature on the relationship between growth and inequality in poor countries, which I will occasionally reference in this book. However, I am interested in wealthier countries that have effectively functioning governments, high levels of human capital, and technologically advanced physical capital. The famous "Kuznets curve" suggests that inequality will rise in poorer countries (as the growth process benefits some more than others) and decline in richer countries (as the benefits of growth spread more widely). Although sharp declines in inequality in the mid-twentieth century in many of the highly industrialized countries seemed to support this theory, inequality rose in the United States and in a number of other high-income countries at the end of the twentieth century (Atkinson, 2003). This suggests that high rates of industrial development and per capita income do not guarantee declining inequality. The second part of this book pushes beyond Kuznets's hypothesis to discern the factors that may lead to rising or falling economic inequality in the developed world.